60 in. x 46 in. x 1 in. 27 in. x 3!2 in. x 1 in. 25 in. x 23/4 in. x 1!2 in. 5 in. x 1 in. x in. 221/2 in. x 21/2 in. x 1 in. 32 in. x 33/16 in. x 1 in. 2215/16 in. x 4% in. x 1 in. 19!2 in. x 2 in. x 1 in. 5 in. x 1% in. x 2 in. 3/4 in. diameter x 3 in. 1/2 in. diameter x 3 in. 1The leveling blocks and footpads can be cut from the foot cutoffs. 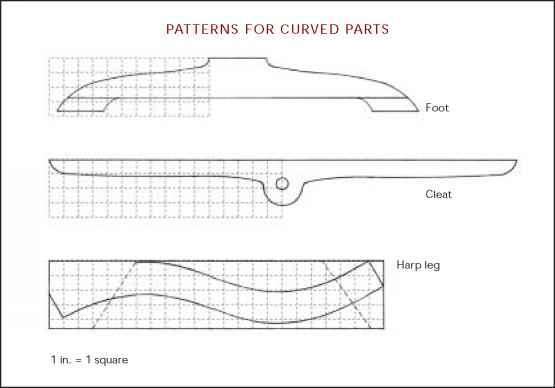 2See Sources of Supply on p. 183.
he elaborate pattern-cutting techniques I described for other projects in this book can be used for this table. However, since vineyard tables are traditionally simple, carpenter-made furniture, I've chosen to stick to basic tools and techniques. A jigsaw, coping saw, or bandsaw is all you need to cut out the parts; scrapers, planes, and sandpaper can be used to sculpt them to final shape. 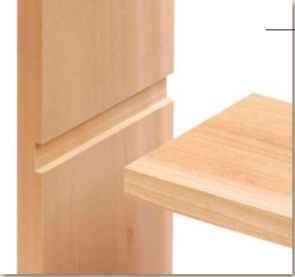 Mortise-and-tenon joints hold the legs and stretchers together, but the lap joint, a very basic joint, is used for the harp pieces, and doweled hinges are used for the moving parts. 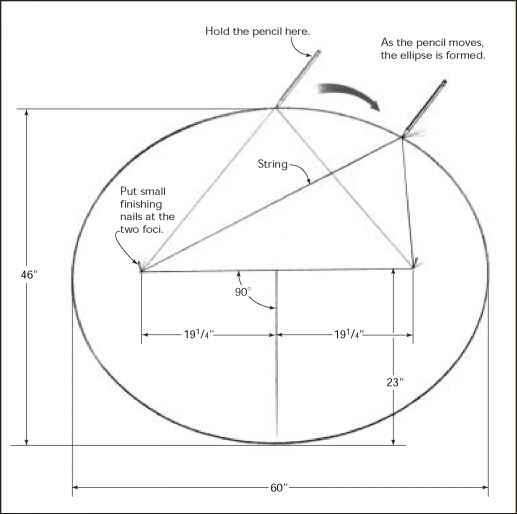 Another new but simple technique introduced here is drawing the ellipse for the tabletop. The most challenging task is to fit the pieces together so that the tabletop opens and closes easily and remains level when open. Since every table is slightly different, adjustments to the dowels and leveling blocks should be made dynamically. The critical dimensions in this table are the lengths of the legs, the widths of the feet, and the lengths of the stretchers. If these aren't equal, the trestle won't be square. In addition, the width of the tabletop must clear the feet when the table is flipped up for storage. The shape of the tabletop determines how much clearance you have. Rectangular tables have about 45 in. of clearance, while round tables have nearly 49 in. because the curved shape clears the feet. Begin with 8/4 rough stock for the feet and footpads and 6/4 rough stock for all other parts. Although 5/4 might work, you would risk not being able to get all the parts out. Crosscut the trestle parts 2 in. oversize in length. Face-joint and edge-joint the boards and plane them to finished 1-in. thickness, then rip the parts to finished width. Cut all tabletop boards to the same length. When cutting to rough length, leave them several inches oversize. Face-joint and edge the boards, then rip them to width and plane to finished thickness. 1. Glue up boards for the tabletop in a rectangular shape, arranging and aligning the boards to get the best match for color and grain. Clamp the tabletop, using plenty of clamps (see the sidebar on the facing page), and allow the glue to cure overnight. The object of clamping is to put pressure on all of the surfaces being glued. Imagine clamp pressure as radiating 45 degrees on either side from the point of application. If the clamps are spaced too far apart, as shown in illustration "a" below, there may be little or no pressure at some points on the glueline. Moving the outer clamps toward the center, as shown in "b," solves the problem in the middle but creates new low-pressure areas near the edges. Some woodworkers recommend springing the boards so they meet at the ends but gap slightly in the center. The board acts as a combination spring and caul, closing the gaps. I prefer using enough clamps to provide pressure at all points on the gluelines, as shown in "c." In this example, I needed five clamps to get enough pressure. With a panel the same size and narrower boards, I would have needed even more clamps. After the glue cures, remove the clamps and place the tabletop upside down on your workbench. 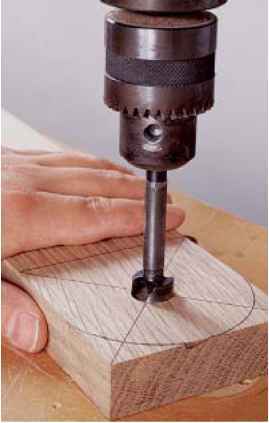 Draw an ellipse on the underside of the tabletop as described in the sidebar on p. 62, and cut out the ellipse using a jigsaw or coping saw. Finish shaping the ellipse with a belt sander held against the edge or a sanding block with 80-grit sandpaper. Cut the feet to final length. Mark out the i/2-in. mortises with a mortising gauge, making sure the mortise is centered on the foot, and cut them out with a mortising machine or chisel. Glue the footpads to the feet and allow the glue to cure overnight (see photo A). Every ellipse has two foci, or focus points. The sum of the distances to the two foci is equal from any point on the ellipse. Following this definition, you can lay out an ellipse with two nails, a pencil, and a piece of string. By varying the position of the nails and the length of the string, you can generate an infinite number of ellipses. To generate the ellipse for this table, draw a 381/2-in. line on the underside of the tabletop, centered along the long axis. Place a small finishing nail at each end of the line to mark the foci. Next, draw a line crossing the center of the first line at right angles. Mark a point 23 in. along this line— this will be the end of the tables short axis. Take a piece of string about 100 in. long, tie it in a loop, and put the loop around the nails. Adjust the position of the knot so that a pencil held against the taut string will hit the point you've marked. (The loop of string, once adjusted, should measure 981/2 in.) Finally, draw the ellipse. Enlarge the illustration below to full size or create a pattern of your own, then trace it onto the feet. Using a bandsaw or coping saw, cut out the feet, then plane, scrape, or sand the edges smooth. Cut both legs to final length. Mark out the mortises for the top and bottom stretchers, then cut these with a mortising machine or mortising chisel. At the top of each leg, lay out a S^-in. square. Draw diagonals between the corners to find the center of the square. Use a compass to draw a half-circle at the top of each leg (see photo B). Mark the shoulders of the bottom tenons and use a table saw to establish the shoulder line. Using a tenon jig and the table saw, remove the tenon cheeks. Sneak up on the final width so the tenons will fit snugly into the mortises of the feet without binding. Photo A: Clamp across the joints to register the sides of the footpads with the sides of the feet. Photo C: Forstner bits leave clean entry holes even in difficult wood. Back up the exit hole with a piece of scrap so the exit is clean. 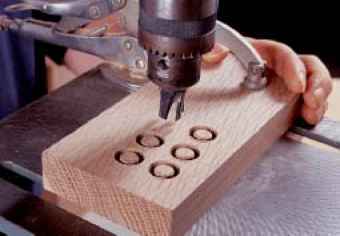 Use a bandsaw or coping saw to cut out the half-circle. Sand the half-circle to shape using a sanding block with 80-grit paper. Drill out a %-in. dowel hole at the marked center, using a Forstner bit as shown in photo C (see Sources of Supply on p. 183). Don't use a paddle or high-speed bit for this hole—you won't get clean or accurate results. Cut the two stretchers to length. Find the center of the top edge for both stretchers, then drill %-in. holes 1 in. deep at both spots to accept the pivot dowels on the harp. Mark the shoulders on one end of a stretcher. Set a stop on your miter gauge, and cut the shoulders for all four tenons on your table saw. Using a tenon jig, cut the tenons. The tenons should fit snugly into the leg mortises. You don't want a loose fit here, so sneak up on the fit until it's just right. A mortising chisel is thicker than an ordinary chisel; the extra thickness allows the chisel to self-jig once the mortise is started. It also absorbs the stresses of mortising. You can order the chisels, and the wooden mallet used with them, by mail from specialty tool catalogs (see Sources of Supply on p. 183). Body positioning is the trick to successful use of a mortising chisel. Just as you tune woodworking machinery, you must also train your body to use hand tools. Start by laying out the mortise with a marking gauge, combination square, and marking knife. The knife lines are important because they delineate the top and bottom of the mortise. Clamp the workpiece to your bench so that it's on your right side if you're right-handed or on your left side if you're left-handed. Position the chisel at the far end of the mortise with the bevel facing you, and hold it with your nondominant hand. Align your body with the workpiece (see the top photo). If you do this correctly, the chisel will be vertical. Holding the wooden mallet in your dominant hand, hit the chisel hard with a single whack. Don't be shy and tap-tap-tap on the chisel. The chisel should cut 1i8 in. or more into the wood with each blow. Next, reposition the chisel % in. closer to you and whack it again. Pry the chisel toward you, and the chip between the first and second cut will come out (see the bottom photo). Keep working down the mortise until you get to the near end. Reverse the chisel so the bevel faces away from you, then cut the other shoulder of the mortise square. Now reverse the chisel to its original position and go back to the far end of the mortise. Continue the mortising operation until the mortise is deep enough. The width of the chisel acts to jig the tool in the mortise that's already cut. If you position your body correctly, and you aren't shy about whacking the chisel, hand-mortising can be very fast and accurate. Photo D: If you cut your own plugs, you can match the grain direction and make the plugs almost invisible. Clamp the stock to the drill-press table so the workpiece doesn't spin. Tip: For the harp legs, the two lap joints are on the same side. 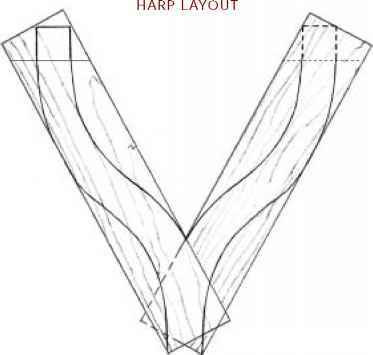 The two halves of the harp are identical. Mark the positions for the pivot holes. Mark the positions for the 1?8-in. radius circles. Either enlarge the illustration on p. 63 to full size or make up your own shape, then mark the pattern onto the cleats. With a %-in. Forstner bit, drill out the pivot holes. Saw out the pattern using a bandsaw or coping saw, getting as close as you dare to the line. Mill up to your lines using planes, scrapers, and sanding blocks with 80-grit sandpaper. % in. deep and 3 in. from each cleat end. Through the center of each recess, drill a hole /8 in. in diameter all the way through the cleat, "wobbling out" the bottom slightly to allow for seasonal wood movement (see the illustration above). 7. Using a %-in. plug cutter as shown in photo D, make four plugs from scrap. The harp is assembled with lap joints that are glued but not screwed or pinned together. Cutting them can be complicated because they are angled, but if you follow the sequence you won't have any trouble. As always, cut the joinery while the workpieces are still square, then cut out the shapes. Practice this joint on scrap wood first. 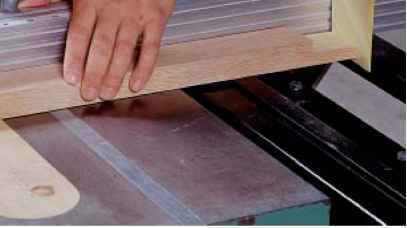 Put a dado set on your table saw, and using two pieces of scrap the same thickness as the harp pieces, mark half the width on each of them. 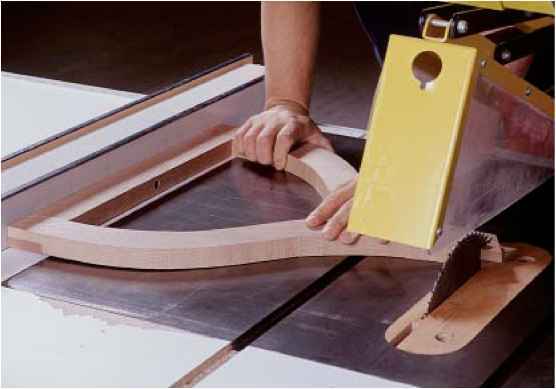 Raise the dado set so it just meets the half-width line, and make two cuts in the scrap using a miter gauge (see photo E). Test the joint, adjusting the height of the dado set until you achieve a perfect fit. Adjusting height dynamically is much more accurate than trying to measure. Now that the scrap joint fits, you're ready to cut your money joints. Cut the two harp legs to length. Photo E: Cut the joint slightly thick, then turn the practice piece over to see the difference between the blade and the remaining work. remove the stop block and cut out the waste on both top joints. Rotate your miter gauge clockwise, setting it to a heavy 57 degrees. Set a stop block on the miter gauge, and cut the shoulder of the lap joint for the bottom joint. Repeat for the second harp leg, then remove the stop block and cut out the waste on both joints. Glue the two harp legs together while they're still square. Now that the bottom joint is finished, mark out and cut the harp shape. Enlarge the illustration on p. 63 to full size or make your own design and trace it onto the workpiece. Cut out the design using a bandsaw or coping saw. Make sure the shoulders of the two top laps are perpendicular. Set the fence on your table saw so you just slightly trim the front shoulder, then flip the harp and trim the other leg (see photo F). Measure across the top of the legs of the harp and cut the cross bar to final length. Glue up the workpieces while they're still square. That way you can glue up across the joint, using the nibs to hold the clamps. The lines of the harp are purely decorative, so don't worry about making them exact. Your only concern is to fit the top bar accurately between the legs. Do this by trial. Tip: Be sure to cut the two lap joints on opposite sides of the harp cross bar. Transfer it to one end of the cross bar, then repeat the procedure and transfer the measurement to the other end of the cross bar. Set a stop on your miter gauge so that one shoulder on the cross bar is correctly positioned. Cut the shoulder using the dado set (see photo G). Reset the stop for the second shoulder, then turn the workpiece around and upside down so that the cut you just made faces up, and cut the second shoulder. Remove the stop and cut out the waste on the two joints. Mark the center of the bottom edge of the cross bar and drill a %-in. hole there. Fit that hole with a 3-in. by %-in. hardwood dowel and glue it in place. Fit the cross bar to the harp leg assembly with the dowel facing down and glue and clamp it. When the glue is dry, cut off the two top nibs using a handsaw. Sand the top flush with an 80-grit sanding block. Photo F: Run the harp against the fence and cut the top shoulders square. Photo G: Fitting the bar into the opening between the legs is tricky. It's easiest to cut both shoulders until the bar just fits. Use paper shims to microadjust the stop. Tip: Once you've drilled the hole for the dowel, the cross bar is no longer symmetrical. Photo H: After you've glued the cross bar to the harp and cut off the nibs, run the cross bar against the fence to cut the harp bottom. This ensures that the bottom is parallel to the cross bar. 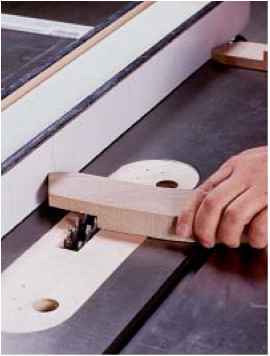 Tip: Make sure the pivot holes on the stretchers are facing up. To cut the bottom of the harp, run the top rail of the harp against the table-saw fence, cutting off the bottom. This ensures that the bottom is parallel with the top (see photo H). Turn the harp upside down and find the center of the harp bottom. Drill a '/2-in. hole into the bottom and fit that hole with another 3-in. by V2-in. hardwood dowel. Glue the dowel into place. Sand the legs, feet, stretchers, cleats, tabletop, and harp to 220 grit, using a random-orbit sander on the flat surfaces and sanding blocks on the curves. Start with a belt sander on the tabletop, using a /50-grit belt, then finish up with the random-orbit sander. Break all of the edges using a sanding block so the edges are comfortable to touch. The top stretcher must be inserted through the harp before the trestle assembly is glued up. If you forget, you won't be able to get the harp on. As usual, doing a dry glue-up will prevent problems from arising when you're gluing for real. Assemble both leg structures dry to make sure everything fits together properly. Use waxed paper between the leg and glue blocks so the blocks don't stick to the leg, and dry-clamp the assembly to make sure you have everything in order. Spread PVA glue into the foot mortises on one leg structure and then onto the tenons on the leg. Insert the tenons, then clamp the structure, making sure all the joints are tight. Repeat for the other leg structure. Measure for square across the diagonals and correct any deviation. tenons into one of the leg structures and hammer them home using a dead-blow hammer. Place the harp, which is already assembled, through the top stretcher. Insert the tenons into the second leg and clamp the structure, using clamp blocks on both sides of the exposed mortise to get good clamp pressure. Make sure the trestle sits square on a flat surface. If it doesn't, adjust the clamp pressure. Remove excess glue and allow the glue to cure overnight. 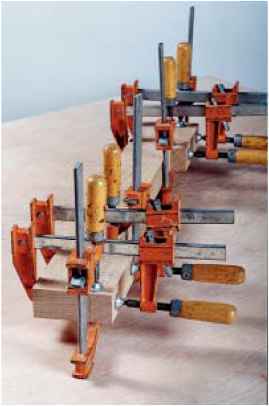 Remove the clamps and, using a sharp chisel, chamfer the edges of the exposed tenons, which should show about % in. on each side of the legs. With the trestle complete, you can fit the cleats to the underside of the tabletop. It is easier and faster to do this dynamically than to try to measure them. Set the trestle on the floor, and insert a 3-in. by %-in. hardwood dowel through the hole in one of the cleats and into one of the legs. The dowel should stand slightly proud of the surfaces. Cut it to correct length using a handsaw, and chamfer the edges of the dowels slightly using sandpaper or a chisel to make them easy to insert. The dowels should be sized to go in and out of the holes with finger pressure. Sand them to size if needed. Attach the other cleat to the other leg. Turn the tabletop upside down onto your workbench, then put the trestle, with cleats attached, upside down on the overturned tabletop. Prop up the trestle so it doesn't fall over. Center the trestle on the top. Predrill for screws and screw the cleats into the top, using l^-in. by #10 steel wood screws. Pull out the pivot dowels and remove the trestle. Glue %-in. wooden plugs into the screw holes. When the glue is dry, cut off the plugs, then level using a sharp chisel followed by sanding. The harp should pivot on the dowels in their holes, rather than resting on the stretchers. You can accomplish this by adjusting the length of the dowels so that when they are seated in their holes they raise the harp slightly above the stretchers. Mount the harp into the holes in the stretchers. Measure the distance between the harp and the stretchers and subtract /8 in. The correct dowel length between harp and stretchers is % in., so you're cutting off the extra dowel length, leaving only the /8 in. After taking the harp out of the holes, cut off the amount you calculated from both dowels. Remount the harp. The harp should now be riding % in. above the stretchers. If the harp doesn't swing freely, sand the dowels with 80-grit sandpaper on a sanding block until it does. The final step is to install the leveling blocks and level the tabletop in relation to the trestle. Rough dimensions for the leveling blocks are given in the illustration on the facing page, but the final dimensions should be calculated dynamically from the finished table. Remount the trestle on the tabletop, which should still be upside down. Pivot the harp so it is perpendicular to the legs, and use shims to level the trestle until the two legs of the harp are equidistant from the bottom of the table. Measure that "leveling distance," which corresponds to the 1-in. measurement shown in the illustration on the facing page. If your measured leveling distance is greater than 1 in., add the difference to the thickness of the leveling block. If it is less than 1 in., subtract that difference. Make two leveling blocks at the calculated thickness. Bandsaw out the slopes and sand them smooth with 80-grit paper and a sanding block. To test the fit, flip the tabletop level, pivot the harp open, and put the blocks into place. The blocks will be held in place for the moment by the pressure between the tabletop and harp. If the block is too thin, add a piece of veneer or cardboard between it and the table; if it's too thick, plane off the bottom. Position the blocks and predrill for the two screws, making sure to countersink the heads. Then glue and screw the blocks to the bottom of the table with F^-in. by #10 steel wood screws. Traditionally, vineyard tables were often unfinished, though some had oilcloth covers held on with a strip of wood tacked to the edge. (If you see nail holes around the edge of an antique vineyard table, you'll know what they were for.) A tung oil finish gives this table a natural look while still protecting it from the elements. If you've made the table from scrap or multiple species of wood, you might want to paint it. Milk paint (see Sources of Supply on p. 183) followed by oil will create a period look. See appendix 1 on pp. 178-179 for details.